This Site for your privacy do NOT use any cookies and NOT collect visitor data. The Site uses only Google Analytic for the site statistics. 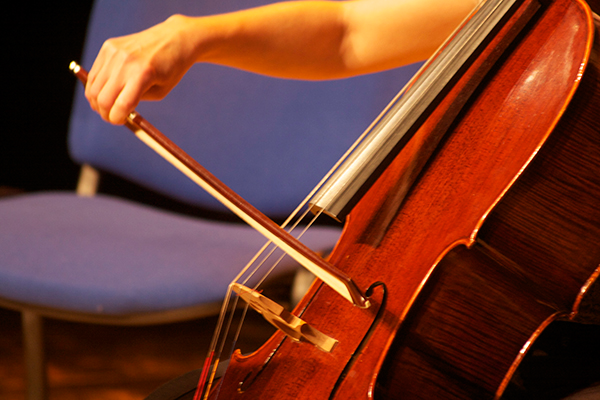 Founded in 1994, the School of Music is open to students of any age and level of preparation and guarantees any personal requirements and individual abilities. 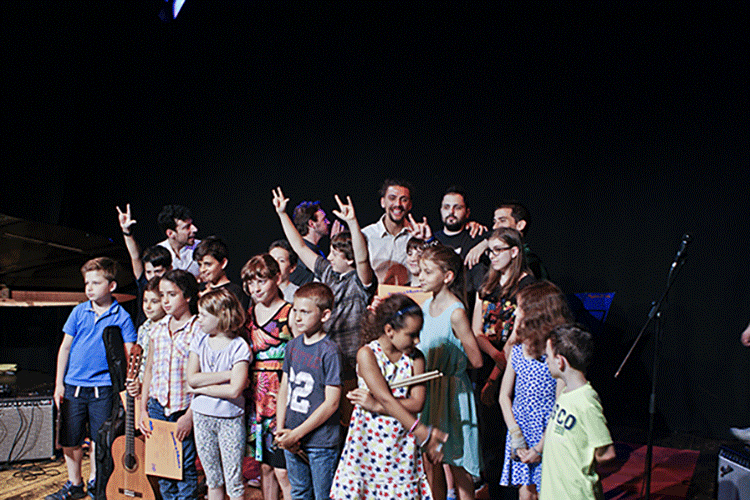 The main target of this institution is to grant musical and artistic education and to promote projects that aim to a higher evaluation of music in a prospective of social growth. The School of Music distinguishes itself by reliability and undertaking of organization and high-quality teaching, since our faculty members are teachers with conservatory diploma and that have an intense musical career (orchestra performers, soloists, conductors, composers). In that sense the School of Music offers a very good musical preparation and a high sensibility for any musical performance. You can consult the study plan of each course of instrument or singing. The study of the Chapman Stick makes us the first music school in Rome to take an interest in this particular instrument. 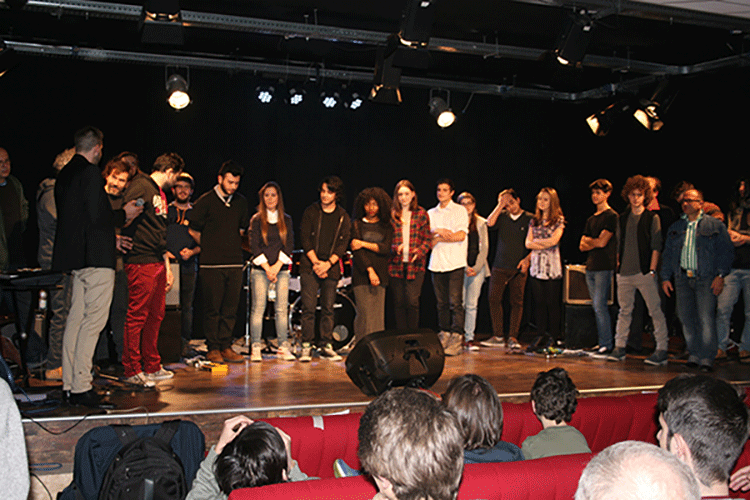 - students who want to make music just for personal experience. Through an innovative educational process, the result of years of experience, you will guide the student in a training program that can provide a sound background both those approaching the world of pure passion for music and for those who in this world would want to make a real profession. Each course introduces the basics of the instrument or singing, indispensable to face any style and then, with proven systems and with the addition of complementary subjects such as theory and harmony, ensemble music, the path is enriched and is healed in all its aspects, giving the necessary tools to become a profession. The teaching follows the ministerial program enabled the conservatories but with a particular attention to the interaction between the two sectors Classic and Modern, to allow a complete musical training to prepare the student to deal with today's professional world. Study plans, proposed by any teacher, provide 3 LEVELS: BASIC, INTERMEDIATE and ADVANCED. The Basic Course is designed for all types of students. Beginners and those with musical knowledge can get close to the instrument or singing through one weekly class of one hour each. In addition, with only a 2 hour meeting per month, we will deepen the theoretical subjects with the musical literacy (for details see below). Depending on the level of each student will be provided for issues and targets through a program which will be delivered at registration. 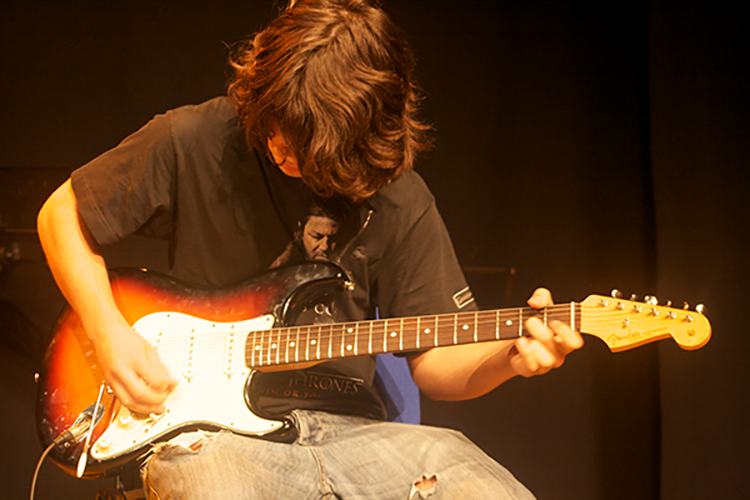 WORKSHOPS are designed to apply individual skills along with other musicians. Groups are formed with compatible levels and ages. The lessons are focused on learning the basics of how to play with other instruments. The lessons are conducted in two sessions of 2 hours each. The students who participate have the task of keeping up with the study for not leaving without prejudice to the other members. The course is suitable for more experienced students who need more weekly meetings in order to guarantee a constant learning to their capabilities. Lessons can be carried out in several meetings of one hour each per week or just a meeting of two hours. In addition there is a monthly lesson of two hours to choose freely among the elective courses. This course is the most intensive course. The students who choose this formula are experienced musicians who have the opportunity to participate in different meetings with different objectives and purposes. In addition to the eight hours of individual lessons and four hours of group lessons are provided monthly 2-hour music literacy and 2 hours of optional course. This is a course to deepen the theoretical issues of music. It helps to read music, to develop a musical ear and rhythmic sense. In addition the foundation for a future course where we study the Harmony elements to be able to compose their own songs. The course consists of three levels that can satisfy every student. Literacy is a group course from October to June. In case of previous musical experiences there is a little test to guide the student to the proper level. At the time of assignment will be handed the entire course material. The course Write a Song is a 9-hour package for bands of any genre. During this short course will address the issues of the composition, arrangement and structure of the text in order to create an original song. The package is intended for all members of the band and is divided into three classes of three hours each. 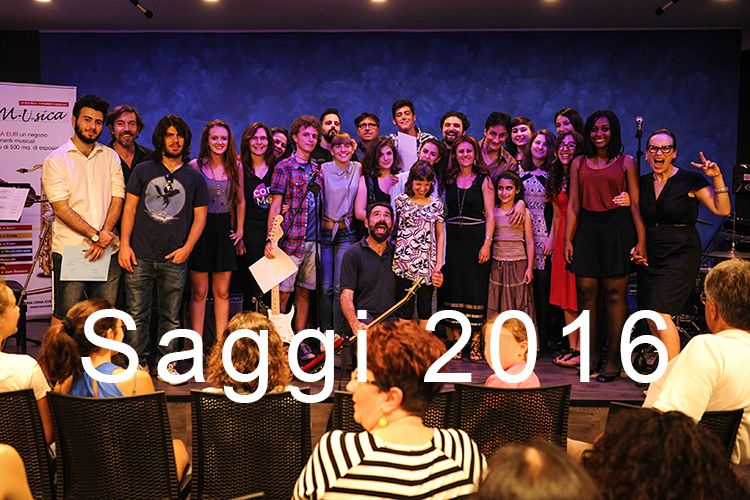 At the end of the course the whole band will have the opportunity to record the original song in a recording studio. The course can be started at any time of the school. Special courses are designed for groups who want to deepen specific subjects. They can start at any time of the school. Each course consists of characteristics which may vary depending on the type of students and of the unwinding period. Custom courses to specific needs by the Student. The customization may relate to both the frequency and the number of participants. The schedule was plan up as to ensure a monthly average of four individual appointments for each student. The day and time of the individual classes are established by the School, subject to availability of courses. And one lesson completely free trial 'allowed. The member must report promptly any address changes. Students are required to inspect the posted notices on the bulletin board. In case of student delay the School is not required to counter the deficit. 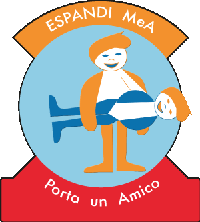 During the lessons it is expected the presence of strangers, including parents, if not on the invitation or agreement with the teacher. Talks are scheduled with the teachers by appointment. The school's classrooms are freely available to students outside of school hours. 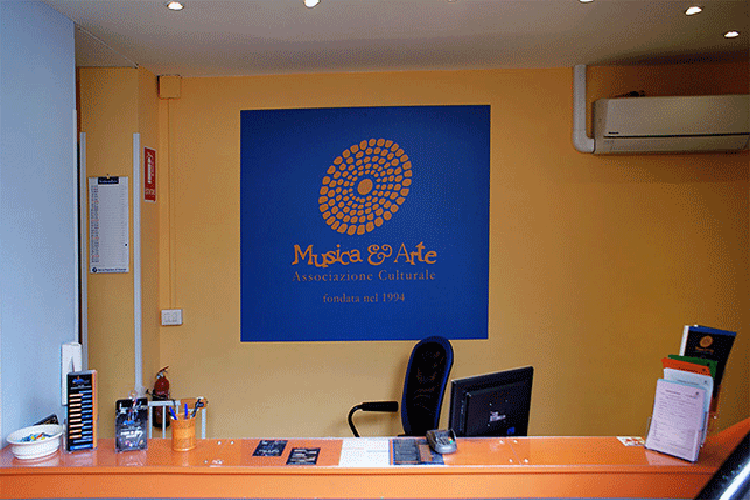 The students of music workshops are required to attend classes regularly. Being a collective course is not scheduled recovery of any lost lesson of a single student. During the month of June will be organized essays by the end of the course, on this occasion is a contribution over the whole of its monthly fee. Students wishing to participate in the end of course essay are required to attend classes during the month of June. Prior to 48 h warning is provided for the recovery of the lesson to the student absence up to a maximum of 4 annual recoveries. In case of absence or delay on the part of the teacher, the school will recover the lesson and / or delay in time determined by the School. In any case, recovery shall be void if the student should decline the same for 3 consecutive times. In case of prolonged absence of the teacher or the impossibility of recovering the lost lesson the school will replace it with a teacher of the same specialty. In case of cancellation of the course by the student prior to the month of June, you no longer have the right to benefit from the recovery of accumulated lessons. In no case the school will refund any lost lessons. When registering to be paid is the annual fee is the amount paid in the first month of the course. Payment of activities starts from the date of registration and the first installment will be calculated in proportion to the lessons of the first month of the course and subsequent to the end of the school year. The monthly fee must be paid within the first week of each month. In the case of relationships between students is a discount of 10% on only the portion relating to the individual course. Payments with their discounts (quarterly, semi-annual and / or annual) shall be paid by the end of the first month on the type of discount. In no event will the school reimburse the fees paid. In the event of withdrawal from the course the member is required to pay the entire monthly fee. Smoking is forbidden in School. During the lessons are asked to turn off mobile phones. School Registration implies the acceptance of these rules. - there is a discount of 5% for those who pay the quarterly fee (to be paid by the 10th of the first three months). - There is a discount of 7% for those who pay the fee every six months (to be paid by the 10th of the first six months). - There is a discount of 10% for those who pay the annual quota for the entire course (to be paid by the end of October). - KINDRED: In the event of a relationship between the students, there is a 10% discount for the second student. A discount of 25% for him on inclusion and a discount for you 25% on the monthly fee in the month after the friend. It is an original gift that you can use for birthdays, Christmas or any other occasion. 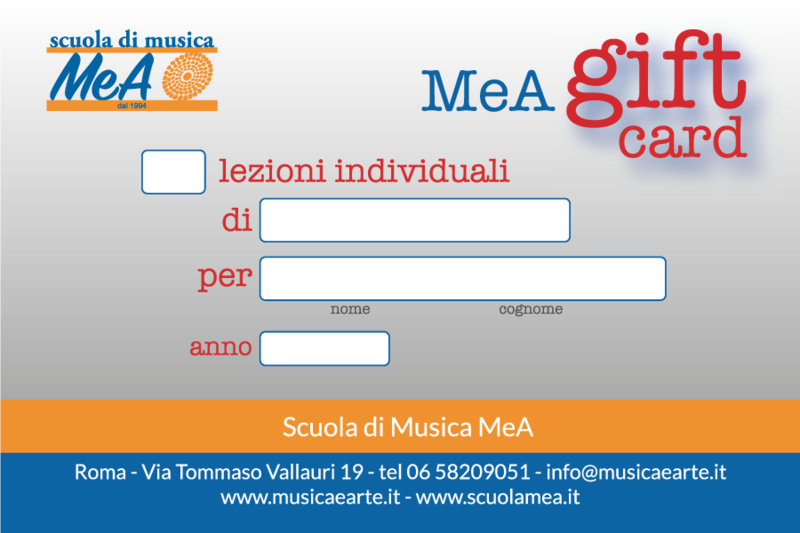 With Mea Gift Card you can choose a number of lessons in your choice for the course of your choice and give it to friends or family. The Card also yearly subscription to the school is discounted by 50% throughout the year. The Card is personal and can be used throughout the school year by deciding schedules that best meet your needs.